Look our tryst with traveling has brought us where! A happy and cheerful travel company that we are, we want to introduce you to our Airline Ticketing Services. 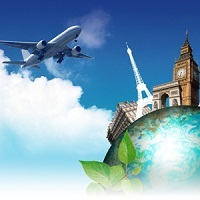 Travel Shop is a Gorakhpur, Uttar Pradesh based travel company. Be the rustic hero of the verdant valleys and drop at the electrifying cities, we would offer you the cheap air fares every day and every month. We benefit from our link-ups with the various consolidators from whom we buy wholesale tickets.